Do you play 1.e4 e6? What the heck is the above? For those not in the know and new to chess, you will not understand it. Actually, it is a chess opening. 1. e4 and 1.d4 are the two most common chess opening moves. This fact is normally known by chess players both amateurs and pro. Actually, GiLoCatur is not really aware that the above chess opening is one of his favourites especially in the yersteryears. 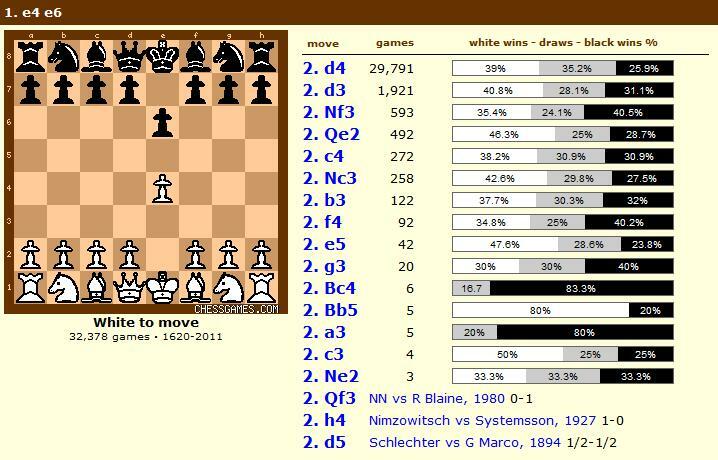 Looking back the previous games (which GiLoCatur recorded), GiLoCatur used it several times when playing black. 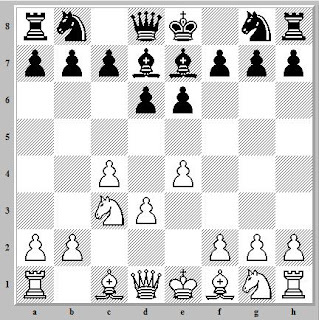 This chess opening used by black is named the French Defense. Its ECO or Encyclopedia of Chess Openings code is C00-C19. In the recent Lim Chong Memorial chess tournament held at DATCC, GiLoCatur used the French Defense when playing against Gilachess in the fourth round. Yup, it was one of the battle of bloggers for GiLoCatur. 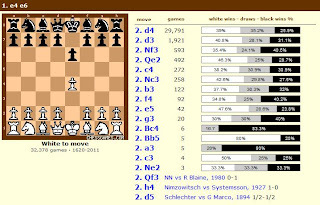 By 2.c4 move, according to the statistics from chessgames.com's chess opening explorer as below picture (how lucky the children of these days where they can study chess easily using the internet), Gilachess joined 272 games. 2.d4 is the most common move with more than 29,000 games in the chessgames.com database. Do you know who are among the top chess players prefer or love to use this opening? Mikhail Chigorin and Victor Korchnoi are two of them. Click here and here for the famous and notable games of the French Defense opening played by Capablanca and Bobby Fischer. Below are three games that GiLoCatur used the French Defense. The first game is a classic or standard game while the other two are rapid games. Believe it or not, GiLoCatur found a site that is dedicated to the French Defense opening here. So, go to the website and study it thoroughly whether you use it or not. GiLoCatur will, won't you? Today is 25th March 2011. It is a special day for GiLoCatur's youngest son. It is his 9th birthday. How time flies. GiLoCatur would like to wish him in Kampar dialect. Hari iko bertambah setaun umu waang, anak manjo ayah. Hari iko umu waang ala masuok gonap 9 taun, adik. Copek bonau waang semakin godang. Semoga dipanjang umu, murah rezoki dan mendapat rahmah dan redho Illahi. 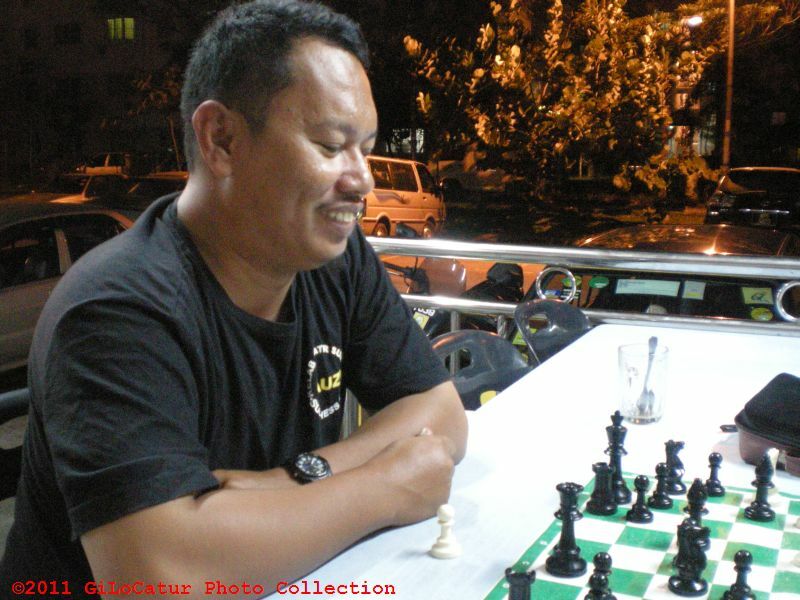 Antaro ciek harapan ayah, semoga Fahim berjayo menjadi GrandMaster. 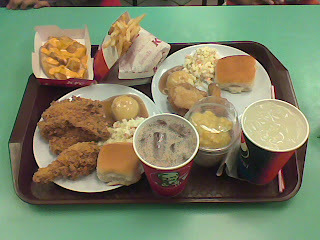 The whole family except Fikri who did not come home this weekend celebrated Fahim's birthday at the KFC located at Shah Alam Giant hypermarket. GiLoCatur took time to check on the Stats button of this blog. 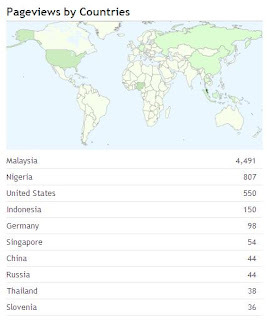 Below is the pageviews by countries for the past month as of today. Maybe the statistics does not mean much to you, but for GiLoCatur it is quite unbelievable that Nigeria comes second in the list. Unfortunately, from the Stats GiLoCatur could not find what post that is really viewed by the visitors from the African country. Can GiLoCatur conclude that chess is also a hit in the country? And another surprising fact that relates Nigeria and chess is that they don't have anyone listed in the FIDE list. GiLoCatur does not why. But it sounds familiar to Malaysia before, isn't it? But anyhow, if you are interested to know further about chess in Nigeria, check the following sites. 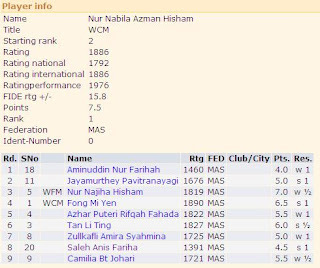 Who is the king of Malaysian chess for this year for men and women respectively? Nur Nabila Azman Hisham (above picture, left) was crowned the National Woman Master or NWM (WNM some people call). She scored 7.5/9 points in the recently concluded Malaysian National Closed Chess Championship. She drew with the defending champion, WCM Fong Mi Yen in the fourth round. Anis Fariha, GiLoCatur's daughter, is one of the new champion's six beaten opponents. She played Anis in the second last round. While Lim Zhou Ren (above picture, left) or well known with his name abbreviation of LZR is the proud new Malaysian National Master (NM). He cruised all the way until the eight round where he drew with the young talented chess player, Yeoh Li Tian. 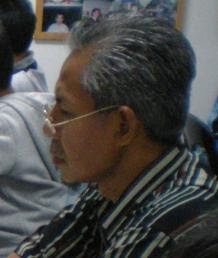 GiLoCatur's eldest son, Fikri was LZR's first victims. Fireyrook published the game between LZR and Fikri here. In the final round, NM Zhou Ren played white against the Malaysian first International Master, Jimmy Liew. The game drew. With that result, he scored 8/9 points. SYABAS and TAHNIAH to NM LIM ZHOU REN and NWM NUR NABILA AZMAN HISHAM! Both of you deserve to be the kings of Malaysian chess for this year. Ini durian bukan sebarang durian. Ini durian bukan sebarang harga. 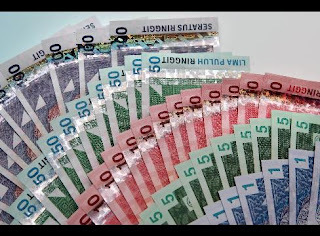 1 kg = RM 15. Berapa harga durian di atas yang GiLoCatur bayar? 50 hengget, dapat discount 2 ringgit. Maknanya, durian tersebut seberat kurang lebih 3 1/2 kg. 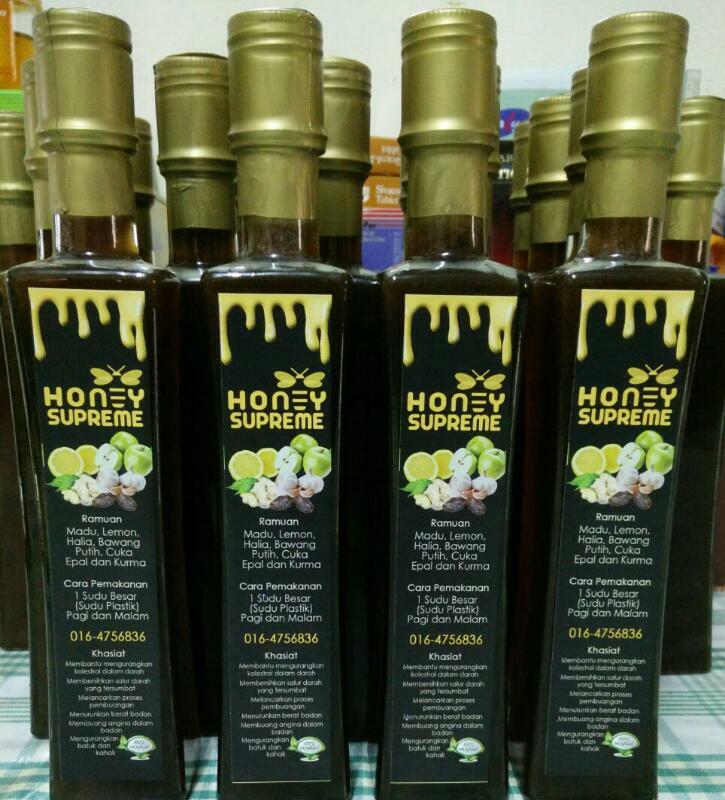 Tapi sebab ia durian tembaga, GiLoCatur beli jugak. Tapi memang tak nyesal beli beb! 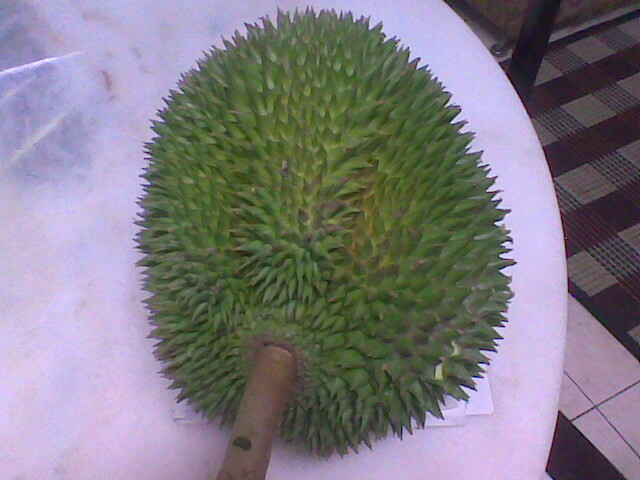 To non-Malaysian viewers, the above fruit is called DURIAN. It is the king of fruits. If you ever come and visit Malaysia, take the chance to have a taste of it especially during its season. Look for D24 type. 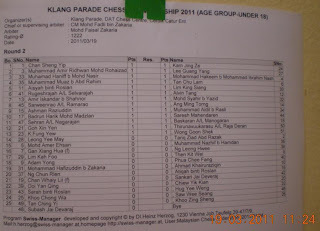 Who is the champion for the Under 12 category of the Klang Parade Chess Championship last Saturday? The answer is Leong Zhi Chen (above picture, left) who had the perfect 6/6 score. He beat 13 other participants to become the champion for the category. Syabas and Tahniah to Zhi Chen who will be sitting for the UPSR exam this year. Mr and Mrs Leong (in the above picture) are surely proud of his son's achievement. 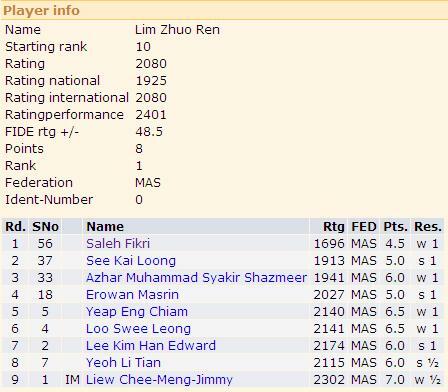 Hopefully, see you guys in Penang this coming June and also in the local chess tourneys. Unrated Kam Jing Ze (above picture, right) emerged as the champion for Under 18 category of the Klang Parade Chess Championship (KPCC) held last Saturday. 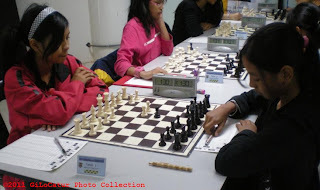 About fifty young Malaysians aged between 13 to 18 years old took part in the six-round rapid chess events. In the final sixth round, he defeated also another unrated player, Ashman Raziuddin who had won all the previous five rounds like him too. Ashman is familiar to GiLoCatur since he was one of the 2010 L18 MSS Selangor squad. 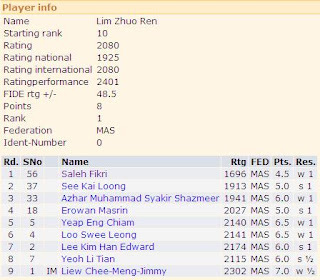 GiLoCatur was surprised when Jing Ze who is studying at SMJK Kwang Hua beat the top seed, Chan Sheng Yip, who is the second board player for MSS Selangor L18 team in last year MSSM Chess Championship in the second round. And again he proved his chess strength and skills when he overcame Tariq Ziad, also a MSS Selangor player, in the fifth round. If he plays in the MSS chess championship this year, GiLoCatur believes he is a player to watch. Syabas and Tahniah, KAM JING ZIE!. Congratulation to GiLoCatur's chess buddie and sparring partner, Fauzi Ahim (above picture), for getting 32nd place out 93 total participants in the Klang Parade Chess Champinship (KPPC) that was held yesterday. He scored 3.5/6 points and seeded 78th. Go to stonemaster.info website to see the full result here. Gilachess Candids GiLoCatur and FirstGM! 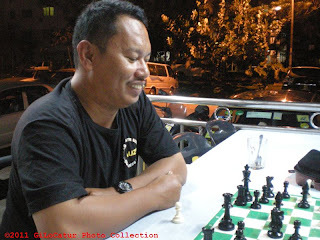 Click here to view the photo taken by a Malaysian "otai" chess blogger, Andrew of Gilachess. Actually, at that time GiLoCatur was so tired and sleepy. Just driving two kids who took part in the recently concluded Malaysian National Closed Chess Championship and waiting for them to finish their two games per day is too tiring for a chess parent like GiLoCatur (and Raymond of the firstGM as well GiLoCatur believes). 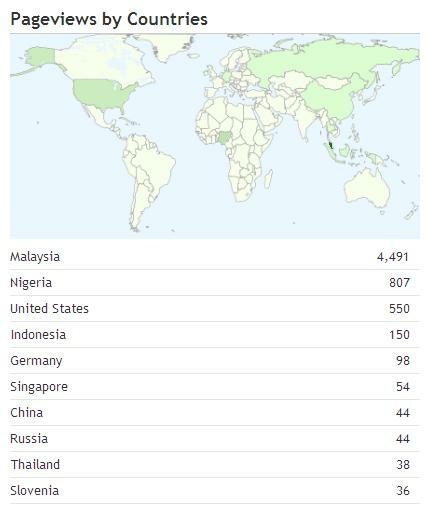 GiLoCatur would like to apologize to this blog visitors especially the Malaysian chess followers for not able to provide the coverage and updates of the chess championship. Actually, GiLoCatur did cover a little at early stage but since the environment at the tournament venue is not conducive to really write about the championship. GiLoCatur posted the men's event in Fikri's personal blog here and the women's event in Anis's personal blog here. Anyway, SYABAS and TAHNIAH to all the winners especially the new Malaysian National Master (NM) Lim Zhou Ren and National Women Master (NWM) Nur Nabila Azman Hisham. Both have many years ahead since both are still very young. The former is about 19 years old while the latter is just about 14 years old. Below are Round 2 pairings for both U18 and U12. Yeah, don't be surprise that in Round 2 Jagathees is on the fourth board. He was defeated by Leong Zhi Chen. Jagathees plays Jane Wong in the second round while Fahim who won in the first round plays against Tiang Chang Yao. Can Fahim continue his winning streak? Let's wait and see. In Under 18 category, Tariq Ziad who is familiar to GiLoCatur was defeated by Lee Guang Yang. Another interesting result and match for GiLoCatur is Leong Yee May who will be the opponent for Tariq in the second round as per in the above pairing. 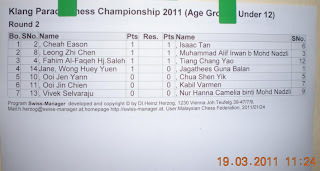 Yee May is also one of the MSS Selangor chess contingent. She had completed her SPM exam and is waiting for the result. According to her father, Mr Leong, she is busy working right now. Only 14 players in the Under 12 age group category. Fahim is seeded fourth. But actually, there are other players who have higher ratings than him. Maybe they do not provide their ratings during the registration or their ratings are not in the pairing system. For sure, GiLoCatur is familiar with the Leongs and Tiangs. Leong Zhi Chen, for example, is the MSS Selangor U12 player. Now, GiLoCatur is at the Klang Parade shopping complex. After sending Fikri, Anis and their mother at the Wilayah Complex for the fourth day of the National Closed, GiLoCatur and Fahim drove off to Klang using NKVE highway. It took us about 40 minutes since the traffics is clear. While walking to the tournament venue at the shopping complex lobby, GiLoCatur saw Ibrahim Nash and his son. It was about a year when we last met during the MSSD last year at Section 2, Shah Alam. GiLoCatur also saw Goh Xin Yen and her mother. Apparently, she does not take part in the National Women Closed. GiLoCatur also saw other Selangor MSS players (check out who they are in the photos and pairings) who surely will dominate the tournament. In about two hours, 92 male and 36 female Malaysian chess players will start their journey in National Closed chess championship. The event will be held at the DAT Chess Center located at the foutth floor of Wilayah Complex, Kuala Lumpur. The list of the participants is already in the chess-results.com. Some played last year, some did not. Let's see several photos of last year NC captured by GiLoCatur held in Bangi. Both Yeoh Li Tian (left) and Mohd Khair Wahiduddin (right) will take part this year where they are seeded 6th and 7th respectively. The above two pictures show the women / girls players who took part in last year edition. Can WCM Fong Mi Yen defend her title? Will former NWMs Alia and Li Ting emerge as the champion again? Or will either one of the Azman Hisham sisters - WCM Nur Nabila and WFM Nur Najiha emerge as the champion this time? We will wait and see until the championship is over to find out, won't we? Former National Master Kamalariffin (left) does not take part this year, but his opponent Ahmad Fadzil Nayan (right) will be playing. Can Nabil win the championship this year? He has extra motivation after emerged as the champion of the Under 18 age group two days ago in Tronoh, Perak. 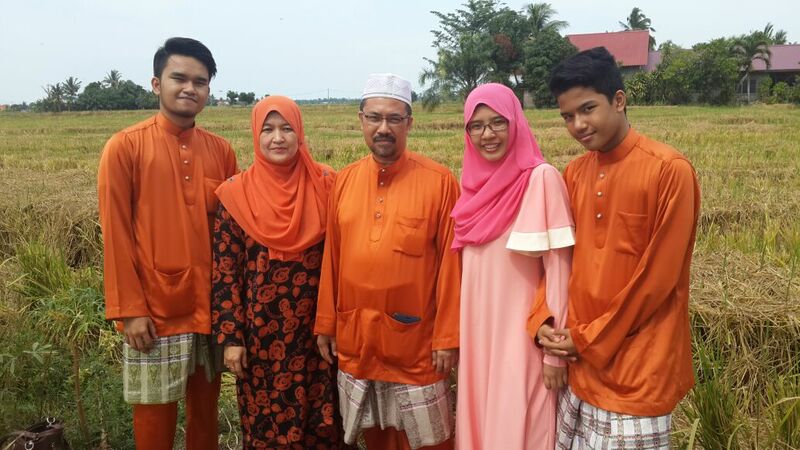 By the way, BEST OF LUCK TO ALL PLAYERS including GiLoCatur's son, Fikri, and daughter, Anis Fariha. SEE YOU THERE! A final reminder from Najib Wahab regarding the NC 2011 that will start tomorrow. “Take note that the final list of participants for tomorrow's National Closed has been uploaded onto Chess Results web page. For both the Open and Women Section, please click here and here for more information. 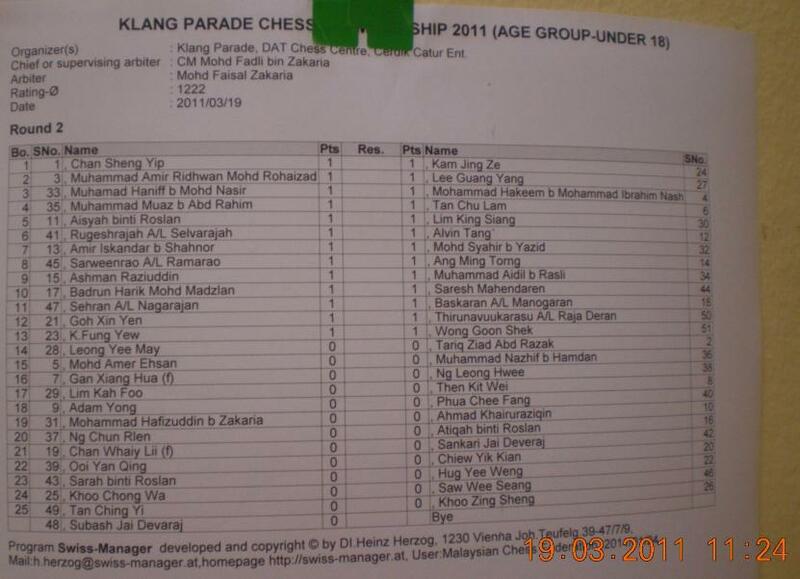 If your name is not on the list, have been spelled or listed wrongly, please contact Najib Wahab, at +6016 338 2542 or email najib.wahab@chess-malaysia.com. NAG is Over, NC is Next! The NAG is over today. All the participants had gone home. Surely, the winners are happy. While the rest are not. Don't give up, play again in next year edition. Where it would be eh? 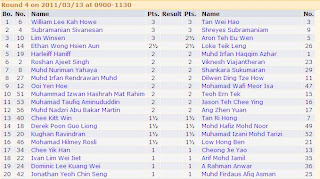 GiLoCatur checked the chess-results.com and knew who become champions while on board of a ferry from Pulau Pangkor jetty to Lumut. Yes, you read it right. GiLoCatur went to Pulau Pangkor for a short trip. That's why, GiLoCatur could not write about the NAG updates. So, below are the champions for all the categories of the NAG 2011. How is the medal tally by state? Only three states - Penang, Selangor and KL had won a golden medal in the NAG.Penang is so dominant in Under 8 and Under 10 categories. It won U8 and U10 for both sections - boys and girls. Penang won in total five Gold medals, followed by KL with 4 Gold medals and Selangor with three Gold medals. ONLY three GiLoCatur's predictions are correct. They are U8 Girls and both U12 age groups. Syabas and Tahniah to all NAG winners. The top seed based on ratings, Sarika Subramaniam, was held to a draw by Amira Syahmina in the second round. In this category, only Hoh Tjin Li scored perfectly by winning all the three games on the first day. Three players are trailing by halfpoint with 2.5/3 points. Sarika will challenge Tjin Li on the top board clash while two Selangor players - Amira and Xin Yen, will battle each other on the second board. 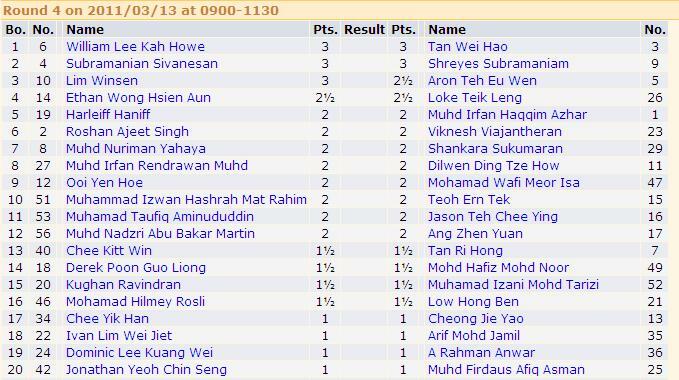 Six players including Pavitranayagi and Vickie from Selangor have 2/3 points. Can Tjin Li from Penang lead this group all the way until the last round? In Under 16 Boys category, the top favourite Yeap Eng Chiam is leading the group with two others Wong Jian Wen and Elgin Lee Kah Meng after winning all their games today. 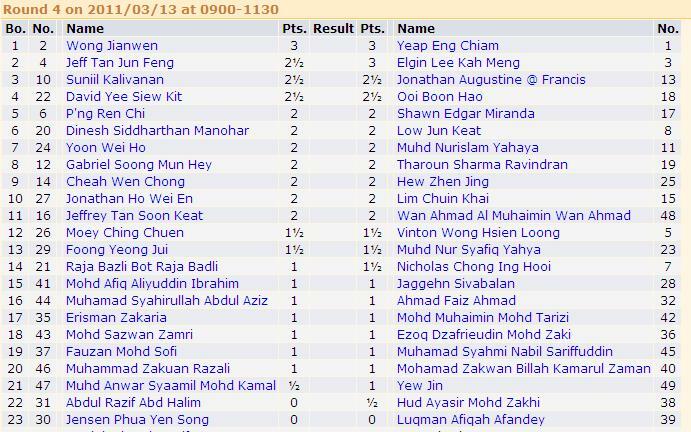 Five others including Tan Jun Feng (KL) and Sunil Kalivanan (Selangor) have 2.5/3 points. On the top board clash in the fourth round tomorrow, Eng Chiam will play against his MSSMKL team mate, Jian Wen. While Jun Feng will challenge Kah Meng on the second board. Who will win? Let's wait and see. Tomorrow, the battle will become hotter. Three players from three different states are leading the pack in Under 14 Girls category. They are Nur Nabila from Selangor, Camelia Johari from KL and Chuah Yi Ning from Penang. They performed very well on the first day of the tournament by winning all their respective games. In the fourth round early tomorrow morning, Yi Ning will play white against Nabila while Camilia will face Tjin Hui from Penang playing black. Can Yi Ning stop Nabila from her winning streak? Does higher rating really helps Camilia to win against her white opponent? You can check this age group results here tomorrow. The top two seeds succumbed to defeat in the second round today for the Under 14 Boys section. Lim Winsen from Penang and Shreyes Subramaniam from Pahang are the happy players. Both of them with three other players - Kah Howe (Penang), Wei Hao (KL) and Subramanian (N9), won all their three rounds today. The fight will become more challenging and tight on the second day tomorrow. Stay tune to know the results. Can Wei Hao win all his three games tomorrow to make it closer to become the champion as GiLoCatur predicted earlier? In GiLoCatur's opinion, the champion for Under 10 Girls section will be one of players on the top 3 boards of the fourth round. 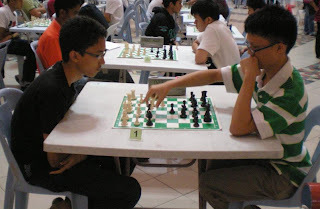 Three players have the perfect 3/3 score - Puteri Munajjah (Selangor), Teh De Zen (Penang) where both of them have participated in international chess tournaments and Teh Ming Min (Penang). 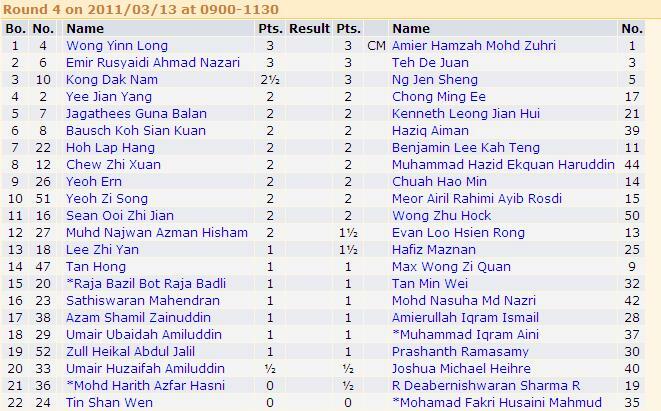 Can Munajjah beat De Zen to cruise all the way to the champion podium? Can she continue her elder sister, Puteri Rifqah, feat last year? Or will De Zen stop her winning streak in the fourth round tomorrow morning? We will wait for the result tomorrow, won't we? 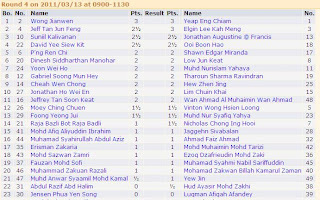 How about the game match of the second board between Shu Zing from KL and Ming Min from Penang? Who will win? Would they draw? Can't wait for the results, right? In Under 10 Boys category, five players won all their first three games today. In the fourth round tomorrow, On the top board, two times U8 champion, Yinn Long of Penang, will play white against Candidate Master Amier from KL, the top seed. They will try to outwit each other in tomorrow's first game to become the leader. While De Juan, the third seed, will be the opponent to beat for Emir Rusyaidi from Kelang, Selangor. One of the top 10 boarders in the above Round 4 pairing has the chance to be the champion. But the five 3-pointer have slight advantage. Let's the stiff fight continue. Penang players are leading the pack for Under 8 Girls category. Both Jia-Tien and Jie Yie scored the perfect 3/3 points. Tomorrow in Round 4, they will meet each other on the top board. On the second board, Nur Faiqah from Selangor will play white against another Penang girl, Asma Umairah. In Under 8 Boys category, Tan Jun Ying from Penang and Lye Lik Zang from KL both scored 3/3 points after Round 3. They will compete against each other tomorrow in the fourth round. Who will win? In the third round, the second seed Ng Shi Yang drew with Muhd Faqih from Selangor. Both will play Bryan Lee Ewe Chuen from Penang and Chew Zhi Qi from KL respectively. How are the results would be tomorrow? Three more rounds will be played tomorrow. Can Lik Zang maintain the lead and finally become the champion? In Under 18 category, for both boys and girls sections, the top two seeds face each other in the third round. These encounters, GiLoCatur strongly believes, will be the turning point for the champions. In Round 2 for Under 18 Boys, both Mark Siew and Yit San drew with their respective opponents. While for Girls category, the result of the match between Kaiyisah from KL and Winnie from Selangor will be the key factor who will emerge as the champion. Would it be a draw? The winner will have the advantage to cruise through. LET'S WAIT FOR THE GAME RESULTS. 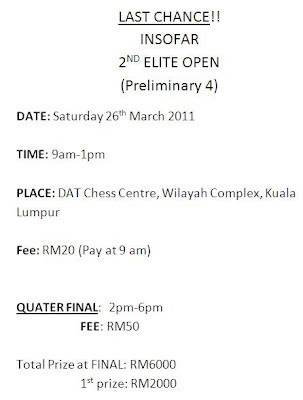 Today is the big day for Malaysian chess junior players. Nearly 400 of them will show their chess skills, strategy and tactics to win their respective categories - U8, U10, U12, U14, U16 and U18 both Boys and Girls separately. Their parents are eager too to see how their beloved children play and perform in the much awaited age group tournament. Some could not make it including GiLoCatur. GiLoCatur just follow the chess championship from home. So, who will become the champions? Who will get the FIDE scholarship as one of the prizes and attraction? Who do you think will be crowned the winners for each age group category? U18 Boys - Fong Yit San (Perak) - home advantage? we'll see about that. This is GiLoCatur's prediction. Surely, you have your own. To all the other players who participate, prove that Uncle GiLoCatur is wrong! Prove that you can become the champion. Give your best! Show your fighting spirit. BEST OF LUCK TO ALL! By the way, GiLoCatur believes it is very important TO ENJOY THE GAME! To those who would like to follow the NAG, check out this blog too. Based on the photos from Yit San's The Fongs' new blog here, GiLoCatur very impresses with the tournament venue hall. 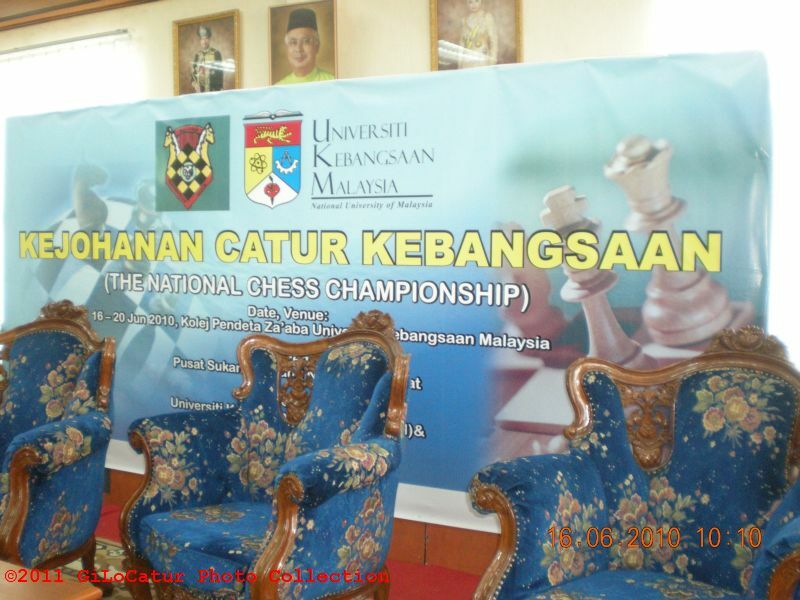 It is not the same one as the 1st National Rapid Chess Championship held in UTP last year which GiLoCatur attended. CHESS is used as an educational tool to promote learning and to help young people develop skills in critical thinking and problem. Why CHESS? Why GiLoCatur supports chess for his children? What the benefits of chess especially for them? What GiLoCatur wishes about chess in his beloved country? The answer can be found in the chess-in-the-schools website. Click here to view CHESS FOR CHANGE slide. Received an email from the NAG's Chief Arbiter, Mr Najib Wahab regarding DRESS CODE and CONDUCT CODE for both players and their parents as well as additional rules during the NAG. 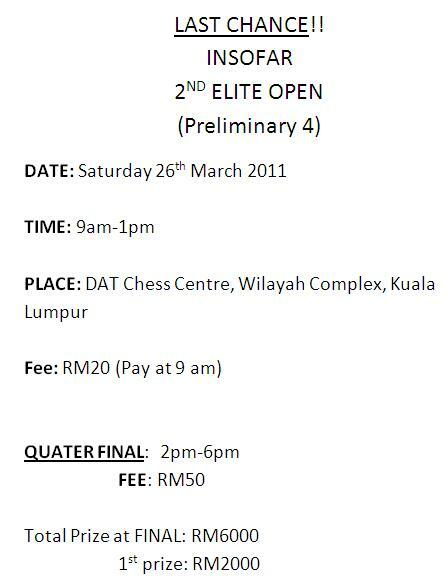 Appreciate if you can advertise the following announcement for participants of the 2011 National Age Group Chess Championship. Below are the list of players for Under 8 section both Boys and Girls. Who would emerge as the champion in this category? It is hard to predict since many of them just make the debut in the NAG. Honestly, just few of them that GiLoCatur is very familiar with. In the Boys section, few from the list were among last year participants. And they were among the top 10 winners. 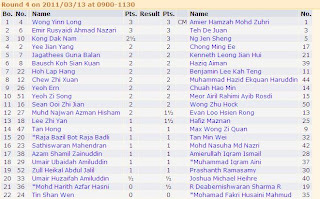 Both Tan Jun Ying (16) and Muhd Faqih Aminuddin (12) were third place and fourth place respectively. The latter even played in the World Youth Chess Championship (WYCC) last October held in Greece. Would one of them become the champion for this year edition? 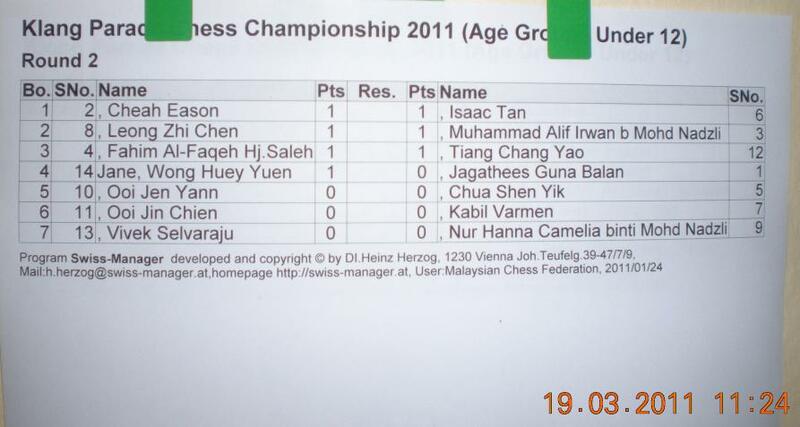 Or maybe the second seed from the list and last year 7th place winner, Ng Shi Yang (14) will emerge as the champion? Can the sole representative from Johor, Lim Rui Yi (7) make upset by winning the category? He was placed 8th last year. The top seed from Kuala Lumpur, Lye Lik Zang (9), should be considered also? Mmmm many players can emerge as the winner, right? Let's wait and see who will win. Wish for Better Money Prizes in Malaysia!